Having already gone through listing the top overall rated rookies and then the best at WR and RB now comes the rankings of the highest rated on the defensive line, at linebacker, and in the defensive backfield for Madden NFL 12. 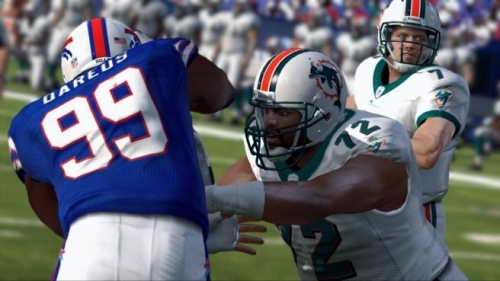 Rookie defensive lineman generally don’t have much impact in Madden. With the exception of someone like Ndamukong Suh there tend to be veteran players rated higher on the line ahead of them. All of the top ten come in with 74 or higher ratings which thus far is the strongest group and only one – someone who without injury concerns could have been the top pick – wasn’t a first rounder. It’s a deep talent pool on the defensive line. Again Nick Fairley is worth pointing out as it would have seemed possible that he’d be in the top ten overall of rookies but four (and a fifth tied) alone on the defensive line rank above him. Up against the other positions linebacker is one of the weakest groups. I expected to see Ryan Kerrigan second despite Aldon Smith going higher in the draft. Smith was thought to be one of the more raw prospects with a high ceiling while Kerrigan comes in more polished and prepared to play right away. Casey Matthews seems to have gotten some credit just for being the brother of Clay Matthews. Only one other rookie (Kendall Hunter) drafted in the 4th round or later has received over a 70 rating. That stands out even more considering only one rookie drafted in the 3rd round (Chris Conte) got over 70. Corners and especially safeties can generally translate well to the NFL immediately so it makes sense that as many as nine DBs come in rated 70 or higher. Prince Amukamara as the third highest rated rookie overall is still glaring judgment while Jimmy Smith – who many believed to be better but took a hit due to off-field concerns – falls a full five points behind him.